I was fortunate to get bottles for review of the OPI Miss Universe collection for this year. As of the time I did my most recent display post, I hadn't seen these in stores yet, probably because I hadn't been in a Ulta for week or two. There are three colors in this group: I'm Feeling Sashy, This Gown Needs a Crown, and Miss You-niverse. I'm Feeling Sashy is a warm medium slightly murky purple creme. My swatch is two coats plus topcoat (added because my nails were looking kind of ridgey and that wasn't the polish's fault). 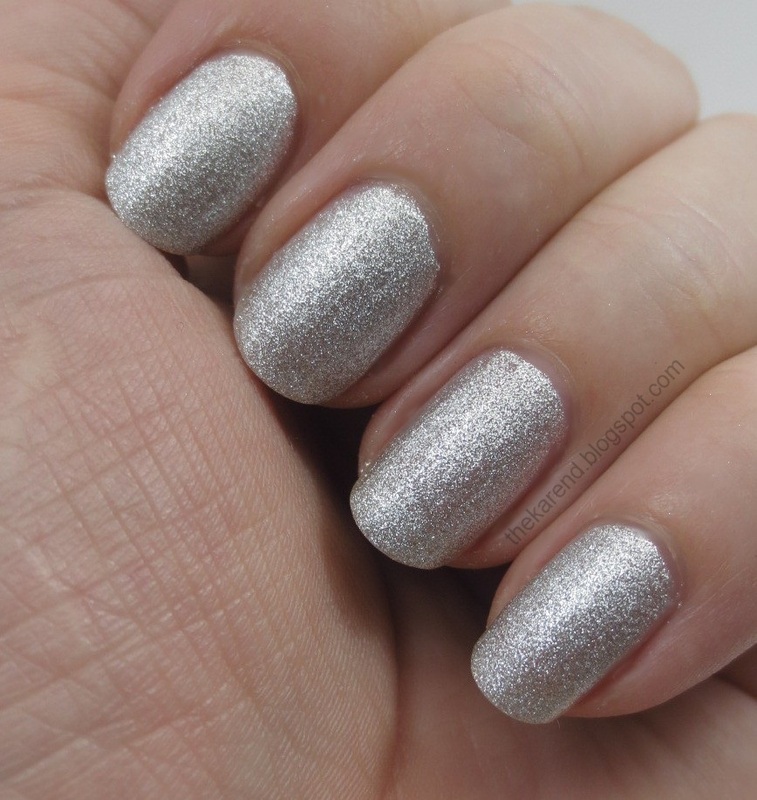 I'm Feeling Sashy reminded me of much the beloved and now retired OPI Parlez-vous OPI so I had to do a comparison. 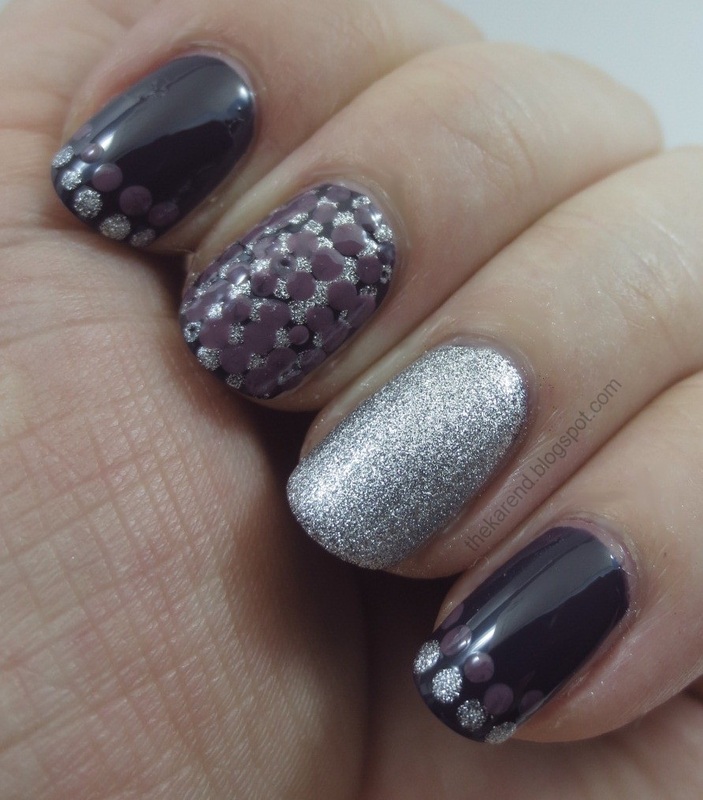 The two purples have a similar feel, for sure, but they are not dupes. PvOPI leans more cool than Sashy, which looks more red-toned alongside it. Left to right below: PvOPI (2 thick coats), Sashy (2), PvOPI (2 thin coats, which let my ridges show), Sashy (2). 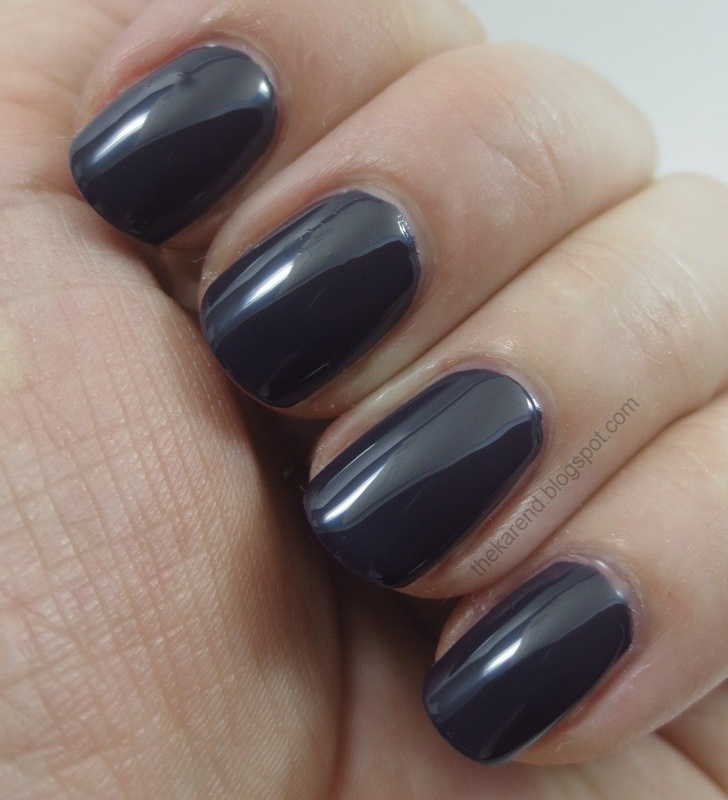 Miss You-niverse is a very deep blue violet creme. As with Sashy, my swatch is two coats plus topcoat because ridges. This one reminded me of OPI Sapphire in the Snow. This pair was closer to being dupes than the PvOPI-Sashy duo. Sapphire is a touch more blue and You-niverse a touch more purple but they are both so dark that the difference visible on the nail was negligible in most lights. Only in very bright light could tell them apart, and only then because I was studying hard. Left to right below: Sapphire, You-niverse, Sapphire, You-niverse. The star of this collection is This Gown Needs a Crown, a fine silver glitter that the cap proclaims has a "satin finish". It also comes with a crown ring—a silver-toned rhinestone-studded crown shaped charm on a stretchy clear elastic band. The first coat of this looked a little sheer to me, so I was surprised when I was able to stop at two coats and still have decent coverage. I agree with cap; "satin finish" is a good way to describe this. It's not matte, but it's not shiny and blingy like most silvers are. If I could use only one word for this, I'd call it "soft". You probably already guessed that my pick from this collection is This Gown Needs a Crown. The cremes are nice if you don't already have similar polishes (though I do wish Miss You-niverse were not quite so dark so the color would come across more). Not crazy about the colors by themselves, but I love how you put them together! I love these, You mani's are so cute!! Thanks for the comparisons. I already knew i was going to skip these, but now I know for sure I have similar colors to both of the purples.